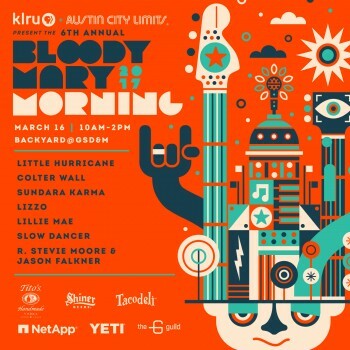 Join Austin City Limits and KLRU-TV, Austin PBS at the 6th Annual Bloody Mary Morning during SXSW on Thursday, March 16 from 10 a.m. until 2 p.m in the GSDM courtyard. This year’s lineup is our biggest yet and in keeping with Austin City Limits tradition of bringing audiences “Great Music. No Limits,” includes some of music’s most buzzed about artists from across the globe and stateside: blues revivalist duo Little Hurricane, Canadian country standout Colter Wall, U.K. rockers Sundara Karma, Third Man recording artist Lillie Mae, Minneapolis breakout rapper/singer Lizzo, Australian indie-folk up-and-comer Slow Dancer and veteran indie music outliers R. Stevie Moore & Jason Falkner. Even better, you can listen to music while enjoying free (while supplies last!) Bloody Marys from Tito’s Vodka, beer from Shiner Beer and breakfast tacos from Tacodeli. Bloody Mary Morning is brought to you by our friends The Guild, NetApp and YETI. So make it a Bloody Mary Morning like Willie would want you to! You don’t need to be a SXSW badgeholder to attend – Bloody Mary Morning is free and open to the public. You can RSVP here. Please join us!